Mowing will be less frequent now as we head into autumn and, as the growth rate of the grass slows, raise the height of the cutting deck or mower. This will afford the grass more protection from the end of the drier weather as well as through the winter. Now is a good time to scarify and aerate the lawn to get rid of thatch and moss, using a walk-behind scarifier or attachments on your garden tractor. Once done you can treat the lawn to an application of a combined weed and feed such as Evergreen to help set it up for winter. You can follow this with a top dressing. If you have areas prone to waterlogging give the area a good spiking to help drainage and aeration. You can use a garden fork for small areas or a PTO driven accessory if you have a Countax or Westwood. If the lawn suffered and went brown in the dry months it should be greening up by now and you can give it a helping hand by treating for moss, weeds, waterlogging and compaction to give it strong growth next year. If you have sowed a new lawn it should germinate after ten to fourteen days and when it reaches 2 to 3cm (1”) high it will benefit from a light rolling. When it’s 6.5cm (2½”) long it can have its first cut with the cutting deck or mower blades set 2.5cm (1”) high to encourage growth. 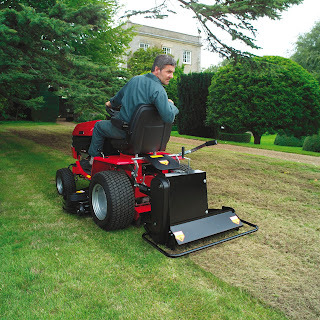 It’s important to ensure the blades on your mower are sharp for a smooth cut without ripping the new grass. If you are laying turves for a new lawn it’s better to wait until October to November when the ground will be wetter but still retaining warmth to promote growth.